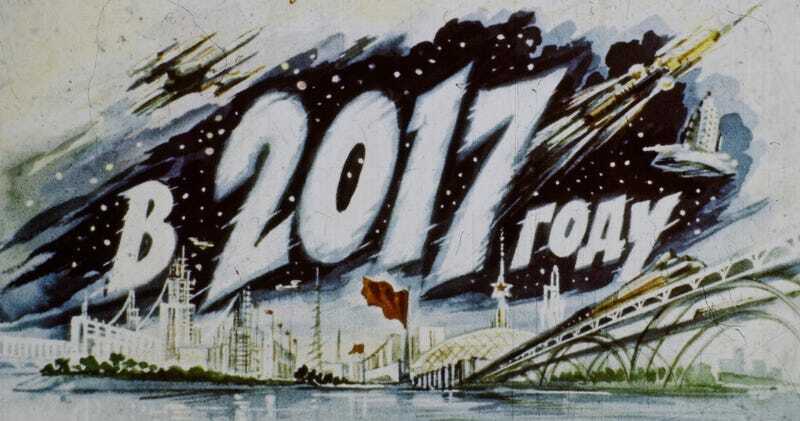 How did the people of the Soviet Union expect to live in the year 2017? A filmstrip from 1960 shows that their expectations were pretty similar to the futuristic predictions of Americans. With a touch more Communism, of course. Matt Baillie from the Facebook group Soviet Visuals sent me a tip about the retro-futuristic filmstrip, which would have been played through a Diafilm in the 1960s—a kind of home slide projector that was incredibly popular in the Soviet Union. The illustrations were created by L. Smekhov and written by V. Strukova and V. Shevchenko. And it’s incredible how closely they mirror what was going on in the United States as far as technological dreams were concerned. I’ve included select images from what appears to be the original source (Sergey Pozdnyakov) below, along with some of the translations from the Moscow Times, which our own Russian-speaking editor confirmed are accurate. Someone also did a video version if you’d like to watch it that way. It has jazzy music and star wipes if that’s your thing. Otherwise, some of the stills are below. The first panel reads “In the Year 2017", naturally. One of the panels shows students of the year 2017 using a “special cinema device” which allows them to look back at how the Soviet Union was created and evolved. Interestingly, the illustration looks like it was almost certainly inspired by the Futurama exhibit from the 1939 New York World’s Fair. Visitors to the fair could look at the futuristic cities of tomorrow in the Futurama ride, not unlike the Soviet kids above. Much like the dreams that were sold in the United States at midcentury, everything in the future Soviet Union would be atomic powered! Including the trains! The children hear the voice of the narrator: “And here is the dam across the Bering Strait. Do you see what’s whizzing over it? Atomic-powered trains. The dam blocked the cold water currents from the Arctic Ocean and the climate in the Far East improved. And there’s amazing space travel, of course. Then in the film, the Earth itself disappears. In outer space, almost at the speed of light, photon interstellar rocketships set off for the nearest and faraway planetary system, Alpha Centauri. The pictures of space travel are decidedly Soviet, but Americans will perhaps recognize a hint of Chesley Bonestell from the mid-1950s. We meet a young boy named Igor in the strip, whose father works in weather control. Weather control, of course, was something that both the United States and the Soviet Union obsessed over during the Cold War as a potential weapon. If this all looks similar to the Jetsons, that’s because it is. And this was produced a full two years before the Jetsons would air on American TV. Did the Jetsons of 1962 rip off this Soviet filmstrip? Probably not. It’s yet another reminder that the Jetsons was a parody show, taking its ideas from 1950s futurism and heightening the absurdity. This computerized kitchen was likely inspired by the other visualizations of futuristic food that would come out in the 1950s. Perhaps they were even inspired by the futuristic fair put on in Moscow in 1959— organized by the Americans who were much more obsessed with the future of food than the Soviets were during this period. Igor’s home has a videophone, as one might expect. You can see it as a standalone appliance on the left as Igor rushes to talk with his mother. Much like the Jetsons, distance isn’t a hindrance to communication for this version of 2017. Igor’s mother happens to be on a “floating kindergarten” of the future on the Black Sea. And what happens when you’re in the harsh winter elements, like the scene you see above? ...where an incredible utopia of perfect weather awaits. These underground cities produce plenty, though. This one, known as Uglegrad is showing a visiting group of students how much they produce. But it’s not all hard work. “An eternal spring reins,” as the guide boasts of what they have built underground in the futuristic year 2017. And much like the impressive drills illustrated in the United States by the likes of Arthur Radebaugh and Walt Disney (through the direction of Ward Kimball in 1958's “Magic Highway, USA”) the Soviets had their own version. Igor’s father works with weather control stations like the one we see above. But there’s trouble in paradise. The dirty imperialists (read: Americans) are messing with weapons that they shouldn’t have. What will Igor’s father do? The dirty rotten imperialists have caused a storm with their damned weapons tests in the South Pacific. The weather station needs to be dispatched to save as many people as possible. On the television screen in the station, an image of the Black Sea coast flashes. A gigantic tornado rips off the roofs on homes, tearing apart a century-old village. The brave men of the weather station have saved the day. When the weather station returns to Moscow, the men are hailed as heroes, having used their weather control powers to save hundreds of lives. Igor and his father embrace, as everyone in Moscow breathes a great sigh of relief and women throw flowers at the brave Soviet heroes. And the family is reunited, if only over videophone for the moment. The imperialist weapon’s terrible weather effects have been contained in the glorious year 2017, but the last vestiges of their capitalist movement probably haven’t been completely wiped out. We assume that vigilance will remain necessary.